If you are running the Wicked Halloween Run in October, the price increase comes up on September 6th. Get registered now! Also use code WR127865 and receive $3 off when registering online. Click HERE to sign up and/or find out more. 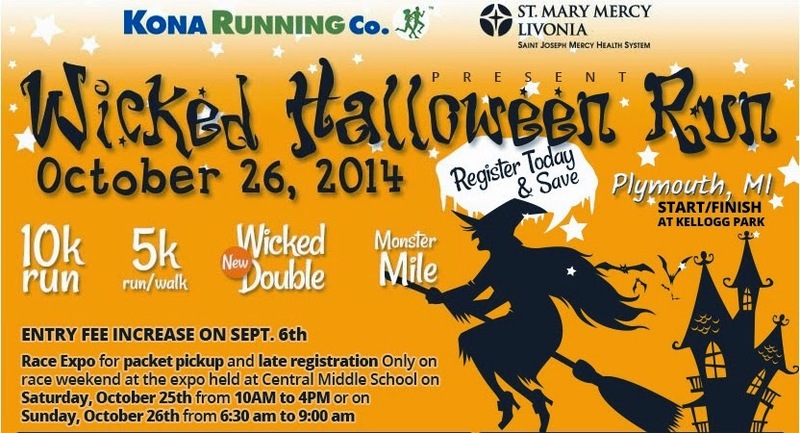 I'll be out at packet pickup working with my daughter the day before as well as I'll be running the Wicked Double. Disclosure: I was not compensated or required to provide this information. I just want you to save money when signing up! This was my first trail marathon. I ran the half a couple years ago and have been wanting to come back. Excellent race with a passionate race director. The feeling of the race all the way through the day is incredible. Since there is an Ultra marathon also going on, I love the relaxed feeling after the finish. While this is not an easy course, if you love the trails and race bling, this race is one to put on your list. One of my favorites courses. I love the North Country trails. Registration is very easy as their website directs you through the entire process. I wanted to be one of the first 100 registered, because you get extra swag, so I registered a full year ahead of time. vThe race sells out very quickly due to it being hugely popular. 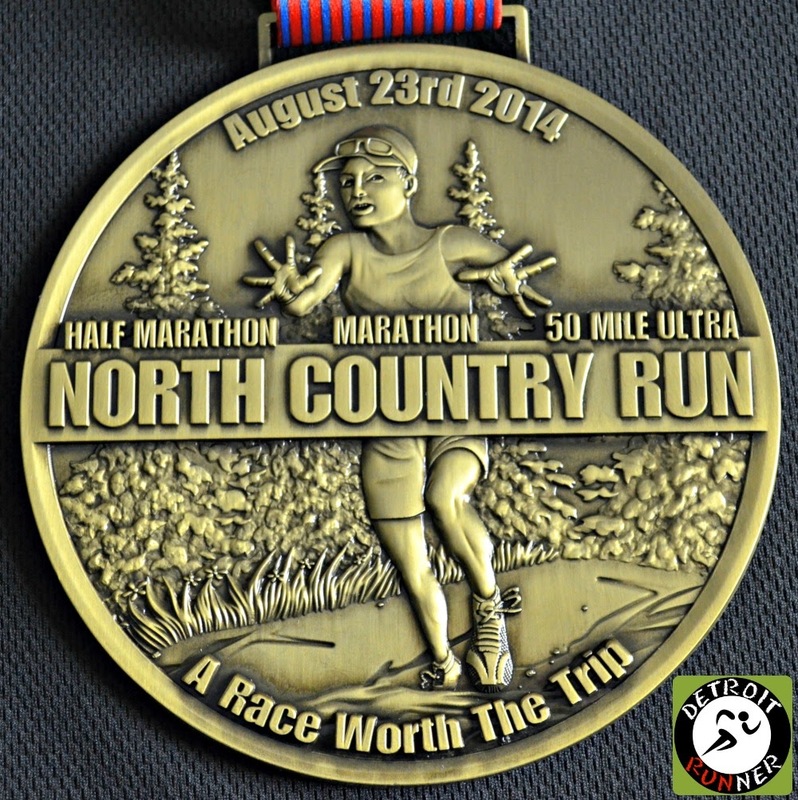 They offer a half, full and a 50 mile Ultra. My buddy Rich and I stayed at my cottage, which is not a close drive - about 1:45 minutes, so it was a very early morning getting up at 3:20am. Our other buddy Kevin was staying closer to town so he picked up our race packets for us the day before so we didn't have to do it that morning. We were picking up Kevin on the way that morning and ended up getting to the race around 6:15am. Kevin and I were running the marathon so our start time was first at 7am. Perfect timing to get parked right near the start line as well as time to get in line to use the bathroom before we started. The race also offers race morning packet pickup as well which is a great feature because I wouldn't have wanted to drive to the race twice had Kevin not been able to pick up our packets. The race was pretty much set up for runners and had bib numbers out so you could get your packet. Since it's not a huge crowd, race day packet is also very easy. It was still dark when we got there but I remembered to bring my headlamp to light the way. You also need to pay for parking since it's a national forest so parking is $5. The volunteers had the envelopes ready to pay for the parking and explained what you needed to do if you had not been there before. Well worth the money to be right next to the start line. I tried to change out my polo shirt size but had to wait until after the race to do it. Fortunately they had extra so I was able to get a better size. Everything I got fit nicely. The start area had packet pickup as well as the start line set up. There were lots of people getting ready and getting their chairs in place to spectate at the area since it was also the finish area. If you were there to spectate for a Ultra runner, you could be there for 12 hours so you wanted to get comfortable at the start. The race was making announcements every so often to fill in the runners. One unique thing the race does is have flags of every State where there is a runner represented. It's the only race I've ever seen do this and it makes for a great finish line to run through. Before we knew it, it was time to race. The race did the Canadian National Anthem and then the US National Anthem. We got to meet a Steven(pre-race) and Dan(post race) who we have been talking to on Twitter about running for a couple years who were also running the race. With that, Kevin and I were ready to run the full. Rich would be running a little over an hour later for the half marathon. Everyone was in good spirits. It was not too hot to start but you could feel the humidity. My main goal for this race was to finish feeling good, although in the back of my mind, I wanted to finish within five hours. As you see, that did not happen but I did finish feeling good overall -- well, at least as good as you can feel for what I believe to be my hardest marathon I've run. I tried to start off fairly conservative but slipped into the 10's pace after a few miles. The first half of the marathon course is not extremely difficult except for one large hill around mile 3.5 and another one about 11 miles in but overall some small rolling hills to deal with. I almost wish it was the opposite and the hard part was the second half but what fun would that be? Haha! I started walking quite a bit more at mile 16 which is not unusual for a hilly trail race like this. In fact, many runners were walking at least the hills and running down them. Unfortunately, around mile 18 I was feeling nauseous from the heat so I only ended up using two gels for the entire race with a little bit of Hammer electrolytes. Other than that, I drank lots of water. Given this was my first trail full and I didn't know what to expect, I'm happy to have just finished feeling good and to be able to get back to my 50k training shortly. While I did know what to expect for the second half of the race(it was hard) since I've run the half before, I probably should have run it a bit slower for the first half. Oops. I apologize for some of the pictures as it was an early start time and the forest is darker so it's really difficult to get good quality pictures while running especially for the first half of the race. I really enjoyed the start and talking with other runners as we passed the time with conversation. The great thing about the North Country trail is that it's so diverse. You can run it and it can turn into a completely different trail. There were lots of forested sections as this was all single track. There was a little bit of open areas and areas with pines and tall ferns to run through. There are parts that are just rolling hills and then parts where there were steep hills or really long hills. It's the single best thing about the race. I cannot stress enough how nice this course is even given the toughness of the run. Below is one of my favorite parts of the course where you are in a forested area and start to come into pines. The softness of the pines is like no other feeling while running. I also really enjoy running where the ferns are growing up to the single track. Everyone was very courteous when passing and simply called out, "passing on the left" and you simply moved out of the way. Of course, I moved out of the way after I checked I wasn't going to stand in a bunch of poison ivy. Haha! Many people also said "nice job" as they were passing too. 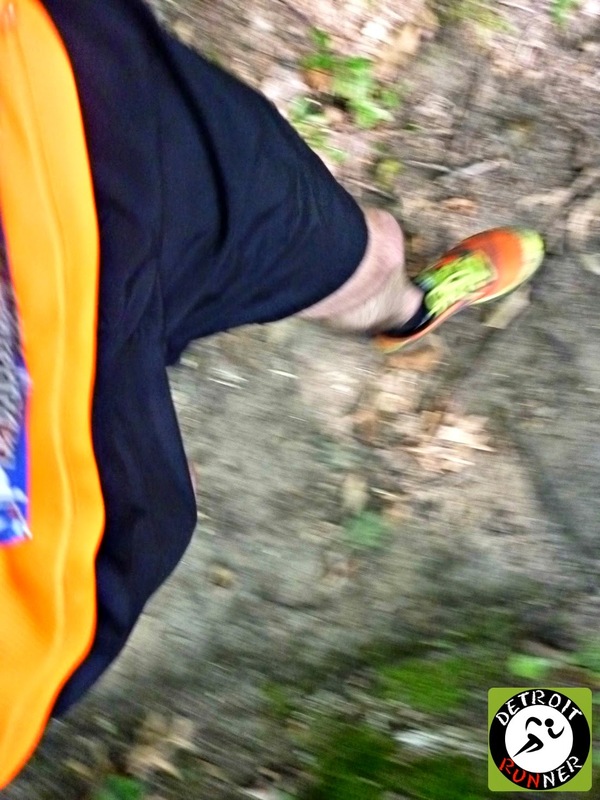 Trail runners are the best! Below gives you an idea of how some of the hills are. Personally, I would rather run up the hill since going downhill for me hurts more than going up even though the effort is easier. As with many trails, it's not really sunny in the forest. In fact, while I wore my Headsweats hat and my Buff to keep the sweat off me, I didn't need sunglasses for any of the course as my hat was more than enough on the course. As with all trail runs, the course was marked for your race. Marathoners and Ultra marathons were running red flags which were 100-300 feet apart and the half was running yellow flags. This means don't follow the person in front of you and follow the flags. The course was marked really well and there was no question of which way you needed to run. The course had extra flags where there was turns of question making it even easier. The picture below was another part that was absolutely beautiful and my favorite part on the course. For some of the race, while you are not completely alone, there are times where you feel alone because you cannot see another runner even though they are sometimes as close as 100 feet away with the turns on the course. At this point in the race, I was walking quite a bit. While I had wished I was running more, it did give me an opportunity to look around a little more and enjoy the scenery. Even with walking though, you still needed to pay attention to the course as I still tripped a few times. Fortunately, I didn't fall once the entire course so I got really lucky. Seen below were the flags we followed throughout the course. Also since much of the course was on single track, there was only one way to go so it was very hard to get off course. Below was an awesome place to run through some taller ferns. Did I mention there were hills? Holy crap there were hills and it made for a much tougher race especially at the end of the race. Below was one of the larger ones. My IT band was acting up a little at this point so the downhills did not feel very good and I had to take them slow. 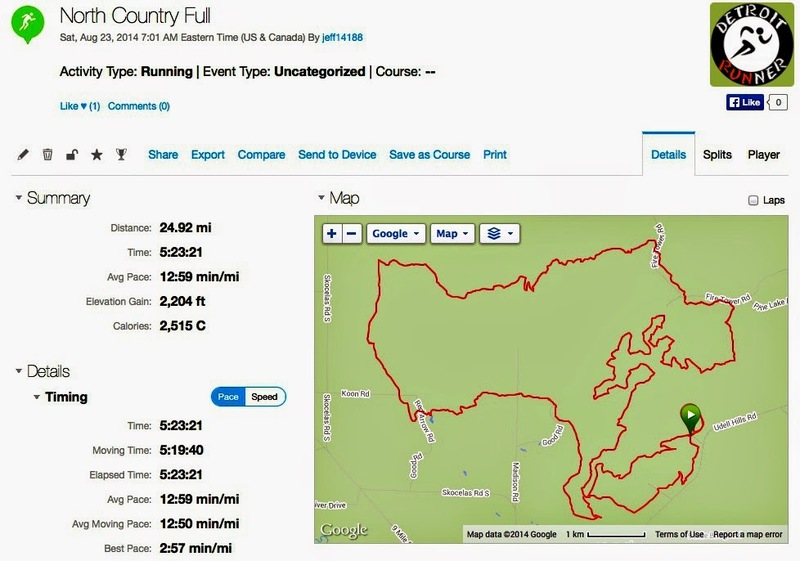 This course is the hilliest marathon course I've ever run but was also great training for my 50k at Oil Creek that will be more than double the elevation. This course sure made me question the 50k in October. Well, at least I know there will be lots of walking up hills like I did for this race. About the 24.5 mile mark, we hit a great place on the course and while it was a huge hill to get there, the view made it all worth while. There was even a bench to watch the view that looking inviting but I continued to move to finish the race. Immediately after this, there was also a huge downhill. The race director must be a masochist as this was brutal to run at the end of a marathon. I felt sorry for the 50 milers who had to do this twice - ouch! We came through to where all the spectators were and we had to finish up by passing the finish line and doing a final mile to get our 26.2 distance. While it was hard to go past the finish line, it was great to have some cheering at the end of the race and provided me with a little boost to go faster at the end. I felt myself getting emotional as I passed the crowd for the final loop. I did the final loop and I was at the finish. I could not have been more happy to be finished! A little girl and her mom were volunteering and the little girl put the medal over my head and said congratulations. It was really cute. A really nice family atmosphere. I was pretty out of it on the course and forgot to take a picture of the aid stations. They were about 3-4 miles apart and there were plenty of them. Especially because of the Ultra, they had all kinds of food as well as water and Hammer products(gel and electrolytes). They also had pretzels, oranges, pineapple, bananas, blueberries that I saw. The volunteers were awesome and cheering all of us to their aid stations. They were really helpful to offer to fill my water bottle and get me what I needed so I could get back out there running. The finish area was one of the most relaxed finish areas in a race that I've done. The race included a full meal with beer so you could sit and relax. I remember from the half that people had chairs so I brought some camp chairs to relax in and eat after the race. There were also some picnic table spread out. Best post race atmosphere of any race I've done! Remember a chair for yourself as it beats sitting on the ground. I paid a little over $80. For this entry, you received a great course that was well marked and chip timed. It had plenty of support at the aid stations. You received a ticket for a full meal and 2 beers. The meal was hamburgers(or veggie) as well as corn on the cob, baked beans, chips, pretzels, and pie. The beer was from North Peak Brewing which is an excellent local beer. It was nice to see a local brewery there. In addition, the swag for this race was just unbelievable! You received a custom race bib as shown below. 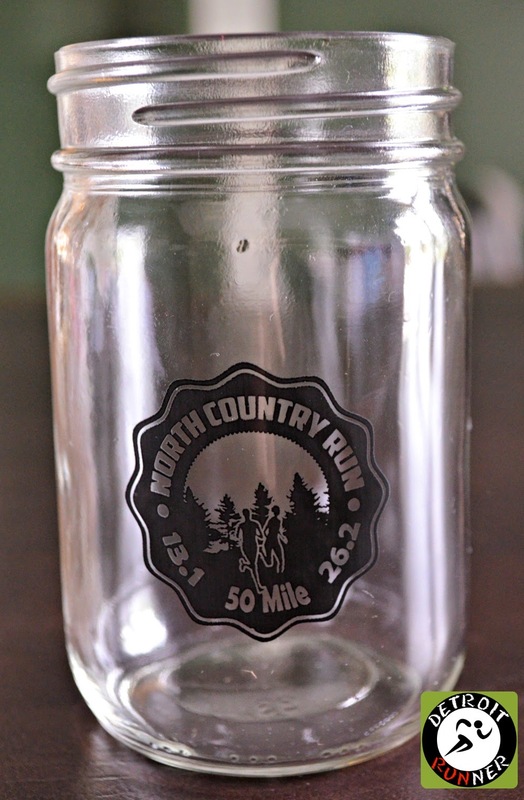 You also received a mason jar for drinking but, in my case, I'm using it to store extra change. You received a nice tech hat with a bright color. It's a comfortable hat that's breathable, light and also nice for running in the dark. You received a race polo shirt which is blue. They did a red, white and blue theme this year for the shirts. This is great and I'll be wearing these outside of training. The shirt was a little small because I chose small thinking the A4 tech shirts always running big but this was just a cotton polo. The race was able to switch out to a medium for me so I could use it. You received a white sweatshirt with the race logo on it and what a funny saying. Pay attention as it says, "I do it" and NOT idiot if you read it too fast. Not that what we do is sometimes idiotic. Ha! 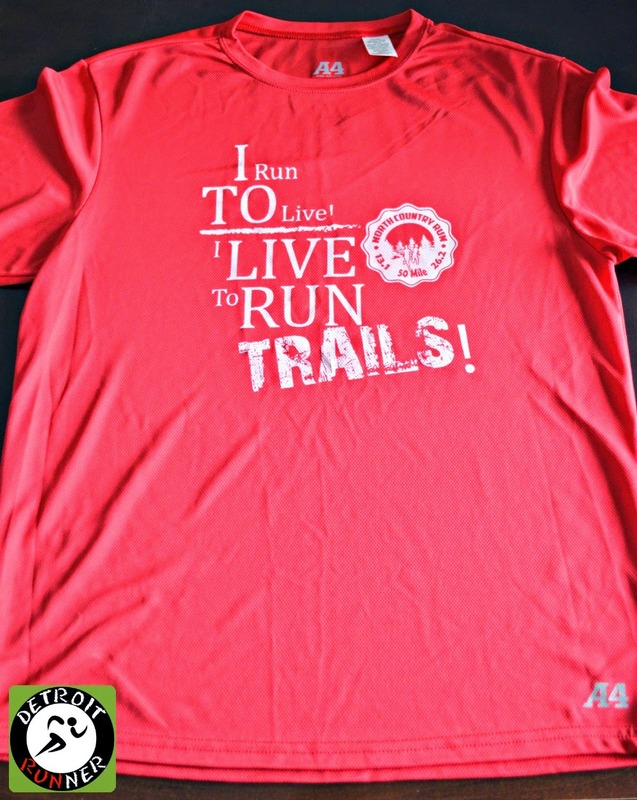 You also received an awesome race tech shirt in red which has a great saying on it. While I have never been a fan of A4 shirts, this material is different than all the A4 shirts I own and finally this one will get used in training. It's very breathable unlike how A4 shirts usually are. I also chose a small in this because they still run very large as I normally wear a medium, and it fits perfectly. The other thing I like is that NONE of these shirts have any sponsor logos on them anywhere. They all have the race logo only which I love sharing that I ran this marathon. Finally, you also received a huge medal that is one of the largest marathon medals in the country. People always want to run this race just for the medal alone! In addition, they are going to make them even larger for the full and ultra for next years race. I even took a picture below with my hand spread out so you can see just how large the medal really is. It's the largest medal I own. The organization is top notch. All facets of the races are reflected in the race directors passion and the volunteers support. The website is well organized with all your answers to questions. The communication on Facebook and Twitter is excellent. A pre-race email was sent prior to race day. The start area and packet pickup was organized and the volunteers knew answers to your questions. The finish area was also well organized. An incredible trail race. The course is fantastic. The swag is unbelievable. The after meal was great. The beer was tasty. The race was challenging but it didn't kill you. Don't get me wrong, it's a tough race but you will get satisfaction of completing this marathon and no matter your time, be proud you finished it. The ultra gives it a much more relaxed feeling and makes me look forward to running an ultra based on how this race is run. For me, the North Country Trail is a incredible trail to run and this part of it is awesome. Whether you run the half, full or ultra, you won't regret signing up for this one.